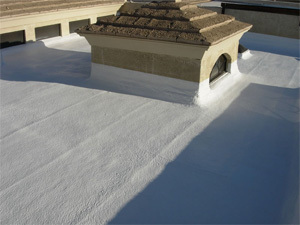 Polyurea linings help to keep your Arizona rooftop protected from all aspects including water leaks, bugs, and temperature changes. The technology found in this unique lining is often ideal for the prevention or reduction of corrosion, multiple uses for waterproofing, as well as lining and immersion applications. This is because the chemical resistance that Polyurea Lining inherently has structured into it. That being said, the applications of Polyurea Lining aren’t just limited to those listed above. The versatility of Polyurea Lining means that it can also be applied to a large variety of substrates, like metals and concrete, to name a few. Plus, it’s durability means that it can maintain its effectiveness even if utilized in harsh temperatures or muggy climes. That being said, it should be noted that the unparalleled adhesion to adequately prepared surfaces means that Polyurea can be used as a legitimate alternative to common lining surfaces such as epoxy or task calls for a resilient and tough liner and 1st Class Foam Roofing is the best to do it for you! But, like any other lining or coating product, Polyurea Lining still needs more than the cursory, hastily done, surface preparation or testing despite many of it’s extraordinary characteristics and overall durability. Which is why it makes perfect sense to call on the services of 1st Class Foam, we take pride in our rigorous performance, always seeking perfection with each lining job. This means you should definitely consider Polyurea Lining for your various surface covering needs. In fact, the first-rate physical qualities of Polyurea makes it a preferred lining used in a large variety industrial projects like water and waste-water tanks, containment linings, cracks in bridges, above and underground piping, ponds, ditches, canals, waterfalls, and of course pools. It can even resist many chemical gasses that come in contact with it in places such as treatment plants. The great thing is that those uses listed are just a few of the many possible uses of Polyurea Lining from 1st Class Foam. 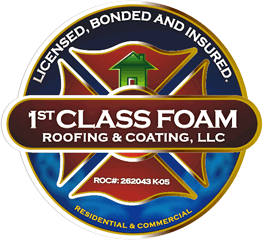 No matter what the job requires you know that when you decide you want excellence in your lining needs, it’s best to have a company filled with integrity like 1st Class Foam to exceed your expectations. This remarkable Polyurea lining can also be used for simple touch-ups or extensive repairs and is definitely worth your consideration when you find yourself needing a professional team to line anything from sea aquariums to water tanks to potable water storage. And when you decide to use Polyurea know that 1st Class Foam Roofing will do it for you and make sure that it’s done the best.